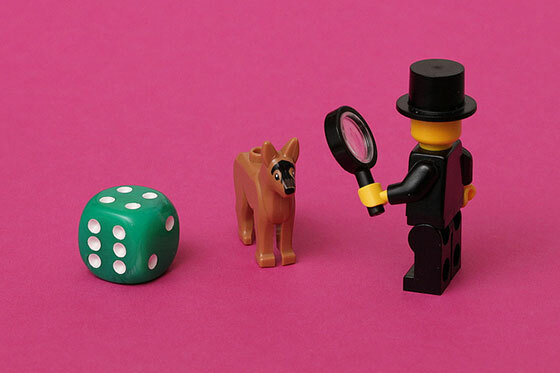 Look to your customers for clues on how to increase conversions. Image by Pascal via Flickr. You spend countless hours and blow through your marketing budget driving traffic to your landing page. You write guest posts and buy PPC ads. Potential customers are coming to your site. But they’re leaving in droves. You do what any marketer would do and run A/B tests. You change the color of the button, tweak the headline and swap out images… but nothing seems to affect your poor conversions. Before you run another A/B test, you need to gather insights from your customers and prospects. The data you collect from your customers is invaluable because it provides a window into the minds of your customers and tells you exactly what they want. This in turn gives you the tools you need to create educated hypotheses about what will move the needle for your business. 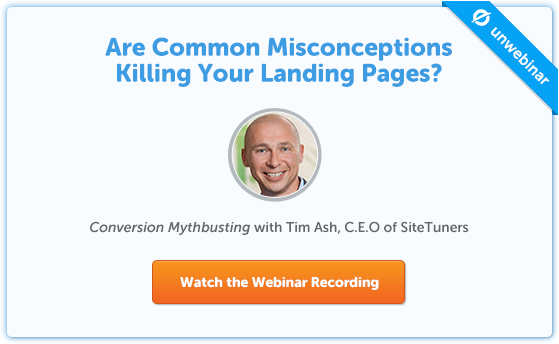 Ready to ditch the guesswork and optimize your landing pages like clockwork? I’m going to show you five ways to gain customer insights so you can increase conversions on your landing page. When it comes to conversion rate optimization, there are things you know about your target audience – and there are things you don’t. And because you can’t optimize for what you don’t yet know about, you’ve got to reach out and ask. Qualaroo is a slide-up survey tool that can be used on your site to gather insights about your prospects’ pain points – and what’s keeping them from converting. 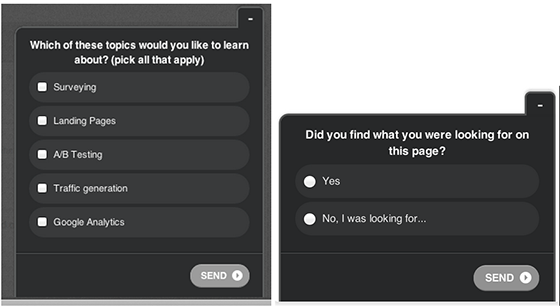 An example of short, qualitative questions you might ask on your website with Qualaroo. Image source. Based on the conversions coming from other popular internet browsers, Steve calculated that the problem was costing them approximately $60,000. Without Qualaroo, KingsPoint would likely still be unaware of the problem, and they’d be losing more sales from Safari users. What type of questions should you ask visitors? While it may be tempting to ask long, open-ended questions, it’s best to ask short questions that are easy to answer. You want to make sure that your prospects don’t have to reflect too hard on the question or they’re likely to move on to something else. Sometimes, there are deeper-rooted problems that can’t be answered with a quick multiple-choice survey. Using a tool like SurveyMonkey, you can create longer surveys to send to customers. Understanding what pushed them to convert (and what created friction) can help you determine what you should emphasize on your landing pages. 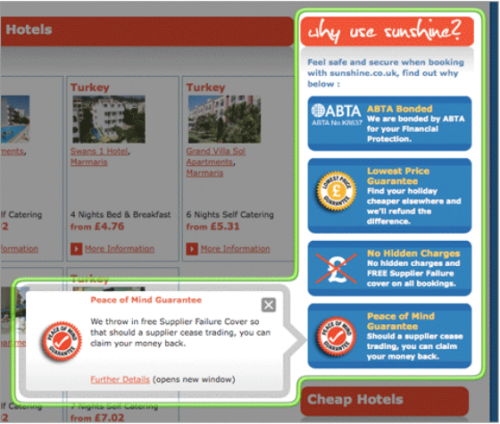 When online travel agency Sunshine.co.uk wanted to increase conversions, they used SurveyMonkey to find out what customers liked about their company and how they’d describe it to a friend. After analyzing the data they collected in their survey, they zeroed in on four benefits that customers found most attractive. They used these four key benefits to distill their messaging to resonate with future prospects. The screenshot above shows how Sunshine.co.uk represented the four key benefits on their site to clearly articulate to customers why they’re better than the competition. It was a relatively straightforward process, but the site alterations doubled conversions over a period of six months. Understanding features that matter to customers allows you to create persuasive landing pages. Unfortunately, many companies receive feedback from customers and prospects that is incomplete. In fact, response rates for surveys can be as low as 15%. When was the last time you were excited to spend 20 minutes of your time answering a survey? Incentivize your audience. The first rule of surveys is to understand that you’re asking for a favor. When someone takes time out of their day to help you, you should show appreciation. This might be something as simple as a free ebook, or if you run a SaaS company, it might be a free trial of your software. Respect your prospect’s time. Remember, they’re doing you a favor. While tools like SurveyMonkey enable you to ask more questions, don’t abuse the opportunity. Only ask questions that you know you’re going to use. If you don’t need to know the age, gender or location of your customers, don’t ask. Make the survey as streamlined as possible. Ask open-ended questions. Don’t rely solely on “rate-scale” and multiple-choice questions. Allow yourself to be surprised. by asking open-ended questions like, “What is the number one thing you struggle with in your marketing campaigns?” You may uncover pain points you didn’t know your target audience has. Explicitly asking for feedback is an approach that can only get you so far – sometimes, implicit feedback can tell you things that your prospects don’t even know about themselves. Our attention spans are becoming increasingly short. If a person can’t figure out what you’re offering in a short amount of time, they’ll simply leave your site – and they might never return. Attention tracking tools like Attensee give you valuable insights about how people are interacting with your landing page. These tools allow you to determine which elements on your landing page are grabbing your visitor’s attention, and which elements are being ignored. 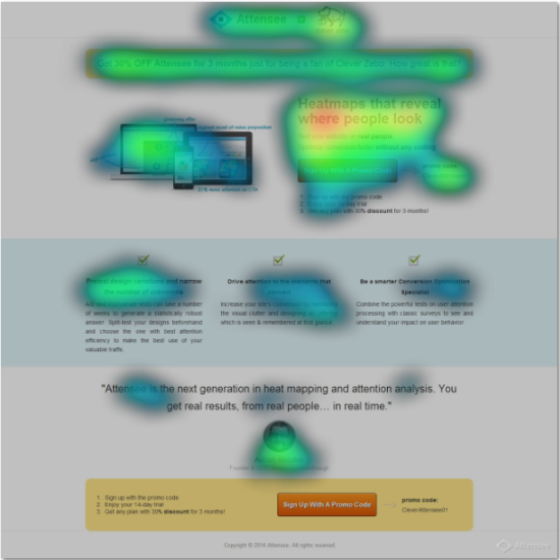 The heat map shows that people were reading the headline and skimming down to the benefits, but their eyepath suggests that something was lacking ­– visitors were becoming disengaged by the time they got to the bottom of the page. Notice how the heat map on this variation has a much more balanced distribution? Simply adding emphasis to the UVP gave people a solid foundation for understanding the other elements on the page – each one adding to the compelling narrative that every landing page should have. Adding the yellow box was a subtle change, but it brought Attensee a conversion increase of 12%. Are people looking at the important elements on your landing page such as your headline, UVP, benefits, testimonials and call to action? 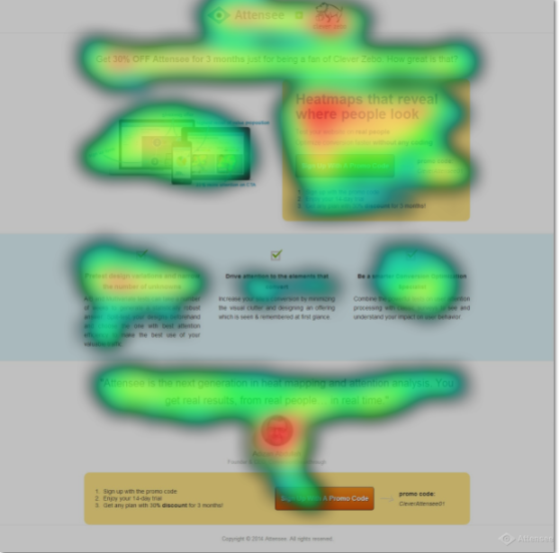 Are there visual cues or conversion-centered design techniques you could be adding to guide their eye? Are they being distracted by page elements that don’t push them toward the conversion goal? Consider removing any text, image or page element that’s getting lots of attention but doesn’t drive people toward your campaign goal. Are people’s eyes straying because they’re looking for information they need to complete the conversion that isn’t provided? Even paying attention to which footer links people are looking at can provide information about what information may be lacking on your landing page. Cut out attention-grabbing sections of your landing page that don’t contribute to the goal. When prospects sign up for your email list, they have self-selected as being qualified by signing up for your newsletter, ebook or webinar. When customer service software Groove wanted to increase conversions, they decided to collect customer feedback by sending the email below to new customers. “If you wouldn’t mind, I’d love it if you answered one quick question: Why did you sign up for Groove? Sounds pretty straightforward, right? Well, the impact was impressive. 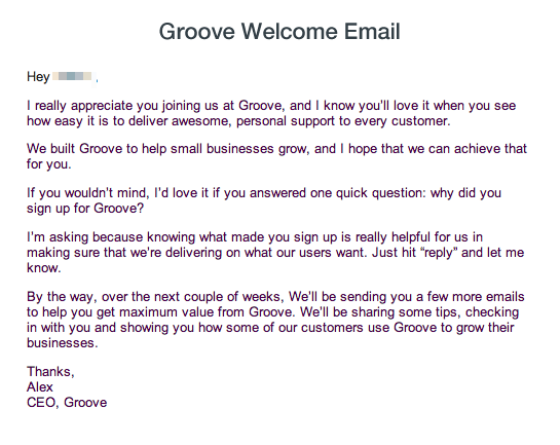 The landing page redesign, aided by their email auto-responder strategy, doubled Groove’s conversions. Once people start responding to your emails, you need to organize the responses so you begin to see patterns. Set time aside to actually read the responses and get to know your prospects better. Organize the feedback in a Trello board so you can start to see high-level patterns. Be mindful of the appropriate time to ask each of the questions above. You should ask people about what incentivized them to sign up shortly after they sign up so it’s still fresh in their mind. If you sell software, give people a chance to learn it before you ask about their favorite feature. When in doubt, test the timing of your emails. Be mindful of the appropriate time to ask for customer feedback. In-depth interviews are invaluable for peering deep into prospects’ minds – the trade-off being that they don’t scale very well. When Moz wanted to increase their landing page conversions, they turned to Conversion Rate Experts to help them out. The combined teams used in-depth interviews with a variety of different customer demographics to gain insight. The qualitative information they gathered was used to redesign their landing page. Coupled with some old-fashioned A/B testing, the makeover resulted in an additional $1 million in revenue. Which features do you like/use the most? Once you have a deep understanding of the pain points of your prospects, you need to effectively communicate your solution on your landing pages and sales collateral. But the process of landing page optimization doesn’t stop there. You may think you know your prospects inside and out, but it all comes down to collecting feedback, creating hypotheses and then running A/B tests to validate your assumptions. My hope is that these five strategies for collecting data will give you the insights you need to get started on this iterative process. Which one will you start with? Tell me in the comments. Aleksander Czyż is the CEO at Attensee during the day and unfulfilled musician/film maker/writer at night. He's a split testing junkie with particular interest in attention economy. You can follow him on Twitter or send him an email.